For travelers eager to catch a bit of old Japan without venturing too far away from Tokyo, an ideal destination lies tucked away in the mountains of Fukushima Prefecture, northeast of the metropolis. Aizuwakamatsu’s location has spared it from the plight that has recently befallen many other tourist destinations in Japan—overcrowding. It’s far enough away to deter most Tokyo day-trippers, yet not so distant as to become inaccessible for a short jaunt. After the Tohoku Shinkansen whisks you up from Tokyo Station to Koriyama Station (a journey that takes about an 90 minutes), you’ll transfer to the local Ban-etsu West Line for the inland journey to Aizu. Rice paddies and serene country landscapes alternate with forested hills, until you catch sight of the distinctive Mount Bandai, standing like an impressive guardian over the entrance to Aizu. All of Japan’s regions have their own unique stories to tell in Japanese history, but Aizu’s tale is especially poignant given that it is intertwined with the rise of modern Japan. Indeed, 2018 marks 150 years since the Meiji Restoration, when Japan abandoned its feudal past and moved to become an industrialized nation under the leadership of the young Emperor Meiji. Ground zero to appreciate this crucial turning point in Japanese history (as well as Aizu’s position during those tumultuous events) is Aizuwakamatsu Castle. Also known as Tsuruga Castle, this was the last holdout of the Aizu clan during the Boshin War—a civil war sometimes referred to as Japan’s revolution, fought between the forces of the Tokugawa shogunate (including Aizu) and the Imperial forces who sought to reinstate the emperor. In 1868, the castle withstood a nearly month-long siege before the samurai there surrendered. The original structure was damaged and subsequently dismantled after the war, but one of its towers was reconstructed as a veritable five-story history museum dedicated to the Aizu clan and the developments during the Boshin War (incidentally, the American film The Last Samurai drew inspiration from the events that transpired in Aizu then, as well as the events of the Satsuma Rebellion). On the expansive castle grounds is a small Japanese garden that serves matcha green tea and traditional sweets.The castle tower has information available in English as well as other languages, and also features displays of authentic swords, armor and historical materials. From the top, enjoy excellent panoramic views of the town and the key site of Mount Iimori. Don't forget to visit the gift shop on your way out to get your hands on some local crafts and souvenirs. Another cool feature of the castle grounds is the butokuden, a martial arts dojo that was constructed in the 1930s. It was here that we met the impressively disciplined young girls who embody Aizu's samurai spirit to this day. 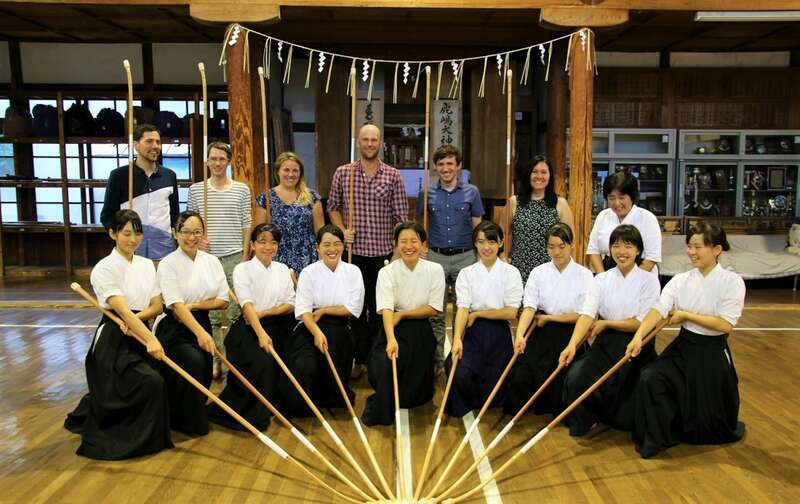 Inside they practice the art of the naginata, a bladed Japanese polearm favored by female warriors. The reach offered them a battlefield advantage, especially against enemies wielding swords. One of the techniques they practice is a sweep of the shin to disable an opponent, leaving them open for a finishing blow to the head. Watching them in action was more than impressive, especially after trying out their maneuvers and experiencing firsthand how difficult they were to master! Located about two kilometers (about 1.2 miles) away from the castle, Mount Iimori is a place that should certainly not to be missed. The name “mountain” notwithstanding (since it's more akin to a large hill overlooking the city), the gorgeous view from the top isn't the only reason to visit. This is the site where 19 teenage members of the Byakkotai (White Tiger Corps) took their own lives at the end of the Boshin War. From the peak of the mountain the young men saw what they thought was the castle burning. They feared the cause lost and their lord slain, and rather than face dishonor by being captured by their enemies, they committed ritual suicide. But their story of honor and sacrifice lived on, and even impressed Japan’s allies in World War II. Mount Iimori features a monument sent from Axis Germany and an authentic Roman pillar from Pompeii sent by Italy’s Mussolini. Today, their legacy is remembered throughout Aizuwakamatsu, and has become an essential pillar in local cultural identity. Even the local elementary school students commemorate their actions with a special (and adorable) dance! Incidentally, one of the most unique Buddhist temples you’ll encounter in Japan is also located here. Sazae-do is the nickname of the Old Shoshuji Entsu Sansodo temple. It derives its name from the double-helix staircase that winds around the structure's inside like a turban shellfish, which is called sazae in Japanese. It is designed this way so that the people going up never pass those going down. Sazae-do is a temple dedicated to the Buddhist goddess of mercy, Kannon, and there are depictions of her throughout the structure. Sazae-do temple was built in 1796, and the original wooden structure is the only one of its kind in the world. Stop and savor the history of this rarity, and keep your eye out to spot the nametags of pilgrims from centuries past plastered to walls and ceilings throughout the building. Aizu is also the location of Sakudari Kannon, a beautiful three-story temple said to be constructed in 830 (though it has undergone repairs throughout the years). The complex itself resembles that of Kiyomizu-dera in Kyoto. Atop a hill deep in the woods, Sakudari Kannon is built against a natural rock formation, and supported by sturdy wooden pillars that have withstood the tests of time. Interestingly, both Sakudari Kannon and Sazae-do are two of 33 stops throughout the Aizu area that make up a regional pilgrimage to Kannon. Those interested in learning more about Japan’s samurai culture should pay a visit to the nearby Nisshinkan. This school for samurai used to be adjacent to the castle, but was destroyed during the Boshin War. The current structure was faithfully reconstructed in 1987 and now serves as a museum and educational institution. While samurai schools like the Nisshinkan existed throughout feudal Japan, few are remaining today that provide such a detailed overview about the education and training young samurai received. This education was quite comprehensive, and went beyond obvious martial arts practices such as combat and swordsmanship. What resembles a pond on the grounds is in fact a representation of what is believed to be Japan’s oldest swimming pool. Here, young samurai-to-be learned how to survive in the water while keeping their sword safely above the water line. Just next to this pool is an archery range where you may even catch sight of Aizu’s samurai descendants honing their skills at kyudo - Japanese traditional archery. Part of the range is also open to the public, but be forewarned, kyudo is harder than it looks! Samurai students also sat in tatami-floored classrooms to learn about various subjects including astronomy and calligraphy, and take school meals, much like Japanese students do in classrooms today. Yet the Nisshinkan also made a point of instilling ethics and morals in the young students, as embodied in the group precepts called Ju no Okite, which included simple principles such as as “Do not lie,” “Do not bully the weak,” and “Do not do what must not be done.” These simple rules helped cultivate a steadfast resolve that the young samurai would bring to every aspect of their lives. There are many more excellent places to learn about the lives of the samurai in Aizuwakamatsu, including the Aizu Bukeyashiki samurai residence. And of course, a trip to Aizu wouldn't be complete without taking time to appreciate its numerous traditional arts and crafts, delicious sake breweries and special local cuisine. There are even hot springs in Higashiyama, not far from the Aizuwakamatsu city center, where visitors can soak in therapeutic mineral waters in outdoor baths surrounded by a lovely natural atmosphere. Needless to say, the samurai spirit is alive and well in Aizu, a city that has something to offer everyone—just be sure to find it for yourself before the crowds come! For more information on Aizuwakamatsu, visit the link below! Japanophile, engaged in translation, interpretation, journalism, food tours, modeling, acting, and voice acting.